Christopher Walken being strange and awesome. Super high strangeness based on supposed actual events. Communion (1989) Starring Christopher Walken and Lindsay Crouse, Directed by Phillippe Mora. Let’s probe the depths of this little gem, shall we? Okay, I admit, I was one of those people who was fascinated by Whitely Strieber’s “true” alien abduction book, Communion. That now iconic image of the gray alien on the cover haunted me. The story sucked me right in, freaking me the hell out because it all took place around where I lived. Always a believer in UFOs, the whole alien abduction phenomena wasn’t something I had really considered. 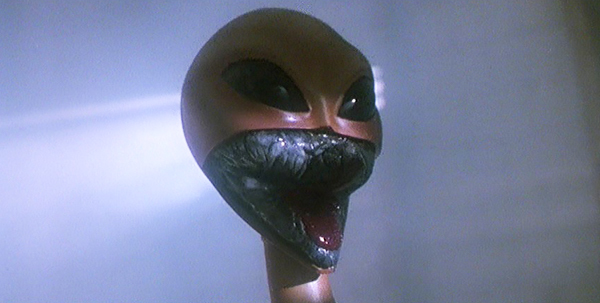 Sure, it looked cool in Close Encounter of the Third Kind, but that was a movie, not real life. Communion wasn’t written by just some hack. This was Whitely Strieber, the man who penned The Wolfen and The Hunger! It wasn’t a surprise that Communion read like a horror novel, but this time, there were, according to him, real stakes, and that made my skin crawl. The fact that a successful author was willing to put his career on the line added weight to the whole story. Communion led to a slew of abduction studies by people like Bud Hopkins and Harvard professor, John Mack. I devoured them all, falling down a rabbit hole that was as terrifying as it was mysterious. If even one person was recalling actual events, well, the world was nothing what it seemed. You can imagine how excited I was when I heard that Communion was going to be a movie starring Christopher Walken. Now, at the time, Walken wasn’t the walking parody of himself that he eventually became, but all his uniqueness and charisma is right there in every frame. Like all movies based on books, it wasn’t a blow by blow reconstruction, but Communion does an admirable job getting the nuts and bolts down. Whitely Strieber, uber successful author, lives in Manhattan with his wife Anne (played by Lindsay Crouse) and young son, Andrew. Strieber has a cabin near Kingston, NY, and they go there to celebrate Christmas. All is mistletoe and holly until he spots weird lights in the sky. He wakes up with a killer hangover and a strange mark behind his ear. He knows something is wrong, but can’t wrap his head around his feelings of dread. Well, dread turns to paranoia, and Strieber is verging on madness, seeing man-sized insectoids at Halloween and strange blue dwarves streaming into his bedroom at night. He becomes increasingly angry and afraid, nearly shooting his wife with a shotgun one night when he was sure ‘someone’ was in the house. And he’s not the only one experiencing odd things in the cabin. So are their friends and, we suspect, his son. Regression therapy (led by Frances Sternhagen who plays Cliff’s mom on Cheers) reveals that he may have been abducted by aliens from another world. Is he going insane, or is this real? And if it is real, how in the world can he protect his family from the space invaders? Communion is one of my all-time comfort movies – a guilty pleasure I feel no guilt for loving. I can’t even count how many times I’ve popped it in when I have 90 minutes to spare. The soundtrack adds a sweet level of creepiness to what is a very strange little movie. I won’t give away the third act, but this is when Walken goes off the rails in his own special way. 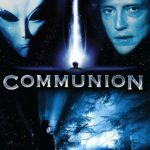 While not nearly as terrifying as Fire in the Sky, Communion is fascinating. Look, if you’re not into aliens or UFOs or Christopher Walken, this won’t be your bag. But if you have any interest in either of the three, give it a watch. It may not have given me, a guy who’d read the book several times, all I was looking for, but I’ll be damned if I can take my eyes off it. Directed by Phillippe Mora, who helmed The Beast Within and Howling II – Your Sister is a Werewolf, it was definitely considered a throwaway movie by the studio. They assumed that anything they put out would put asses in seats. With a modest budget of five mil, they were wrong. It was a flop. However, I’m sure they made their money back in video sales/rentals. It’s since become a cult movie, and sometimes, that’s worth more than box office numbers. You don’t have to believe Strieber (who has since made an industry of the alien abduction/agenda). Just sit back and enjoy. Don’t bother locking your doors and windows. Nothing can stop the Grays if they want in. 7 of 10 alien probes.